Show them you love them. It should really go without saying, if two people really love each other, they shouldn’t have to break the bank to show it. On a similar note, Valentine’s day is completely rubbish isn’t it? Like it’s genuinely awful and it still baffles me that people spend a fortune celebrating it. But maybe I’m just miserable. If you’re dead-set on going out and being romantic though, Wetherspoons has stepped up, like they always do, to offer a budget alternative to dining out at some fancy restaurant. 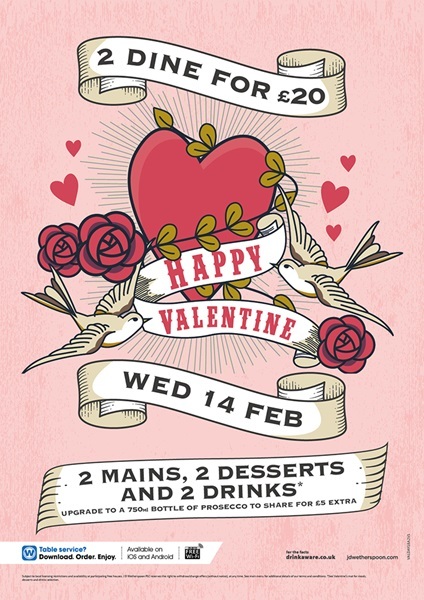 The bar/restaurant chain has devised a brilliant £20 food and drink two course menu for anyone wanting to show their loved one just how much they mean to them this year, and it actually sounds pretty good value for money. With quite a lot of options to choose from off of their menu (including STEAK), you can have the meal you and your loved one deserves for literally half the price. It is a WIN-WIN. For an extra fiver, you can even throw in a 750ml bottle of their Prosecco – who says romance is dead? 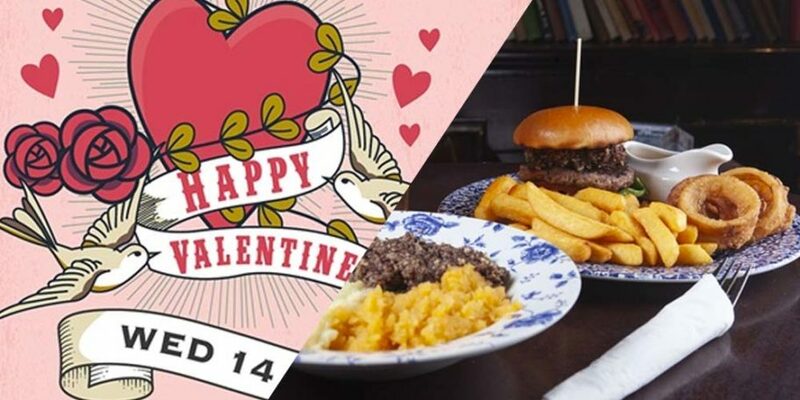 The deal is ONLY valid on the Thursday that Valentine’s Day falls on, so you may want to get planning which one of your local ‘Spoons you’ll be taking your partner too, and what you’ll have off the menu – as I’m sure it’s going to be very busy. Maybe even get yourself a side of the cookie dough sandwich dessert. Perfect for those who are on a budget, but still want to show their loved one that they haven’t forgotten them on the internationally renowned day of luuuurve. Our specially selected prime sirloin is succulent and tender. With peas, tomato, mushroom – chips (add 597 Cal) or jacket potato (add 265 Cal). Gammon, pork loin, rump steak, lamb, sausage, peas, tomato, mushroom – chips (add 597 Cal) or jacket potato (add 265 Cal). Two succulent 5oz gammon steaks, topped with fried free-range eggs. With peas, tomato, mushroom – chips (add 597 Cal) or jacket potato (add 265 Cal). Grilled chicken, cheese, bacon, BBQ sauce. With peas, tomato, mushroom – chips (add 597 Cal) or jacket potato (add 265 Cal). Chicken breast, a half rack of BBQ pork ribs, coleslaw (add 98 Cal), six onion rings (add 338 Cal) – chips (add 597 Cal) or jacket potato (add 265 Cal). Coleslaw (add 98 Cal), six onion rings (add 338 Cal) – chips (add 597 Cal) or jacket potato (add 265 Cal). Italian egg pasta in a rich aubergine, red pepper, courgette & slow-roasted tomato ragù sauce, with mature Cheddar cheese, creamed spinach, mozzarella, a nut-free rocket pesto, side salad, dressing. Ice cream 713 Cal or custard 536 Cal.